Hello, I propose you this flat T5 very pleasant to live. Located in a dynamic area, on the 4th floor of 5 of a small building with elevator. It is close to all means of transport (tram, bus). A 5 minute walk is the train station, the university, as well as many shops and 10 minutes is the shopping center Docks Vauban. You will have 80m2 well arranged, including 4 bedrooms, 2 bathrooms, a large living room and a large balcony. The apartment has been completely redone. 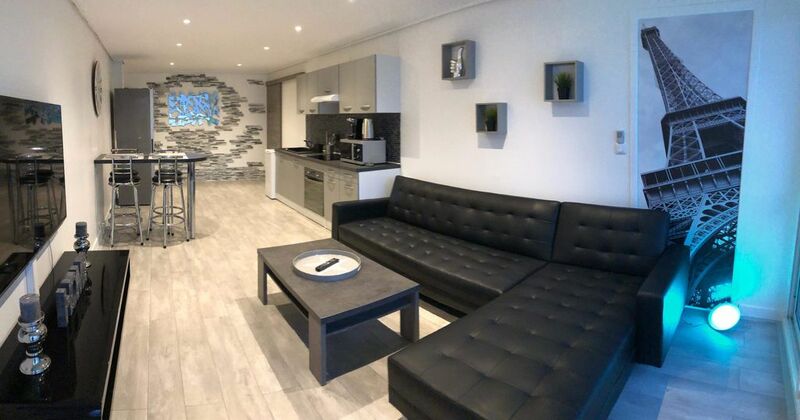 The apartment is fully furnished, offering multiple services, such as washing machine, TV wall mounted in the living room, new kitchen open to living room with large fridge, ceramic hob, oven and microwave. Renovation work was done in 2018 by professionals. In the photos you have an overview of the new living room of 30m2 and two new bathrooms that are almost identical. The 4 rooms are impeccable and equipped, including bed 2 places, wardrobe 2 doors, as well as a desk. The residence is completely secure and quiet, with street code.